Radio Islam was registered in November 1993 as a section 21 company. It was granted a license in April 1997 and our first signal broadcast was on the 10 April 1997. Since inception, the station has established a captive audience based on its specific religious content. With internal growth, wider expertise and a broader range of content has attracted a wide audience in areas well beyond its licence mandate. We are guided by the Noble Qur'aan and the Sunnah (traditions of the Prophet Muhammad, peace be upon him). What is done at Radio Islam? 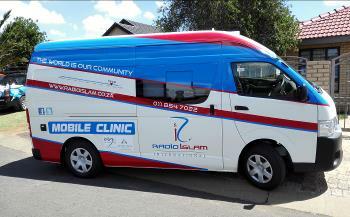 Radio Islam aims to promote the message of Islam. It has also become synonymous with Islamic values and a tool to dispel misconceptions relating to Islam and Muslims in South Africa and abroad. The station has become a beacon of guidance and an invitation to the world. Through the broadcast of high quality info-edutainment, Radio Islam has become a bridge a cross the community divide. Radio Islam is opposed to discrimination based on gender, race, political persuasion, class, religion, belief, language and disability. The station has lived up to the adage, "Your Favourite Learning Station" and "The World is our Community". • The promotion of Islam to all via the airwaves. • The upliftment of humankind. • Striving to be an authentic Islamic voice. • Alternative news and current events programmes. (Parts of Greater Johannesburg) Lenasia, Eldoradopark, Soweto, Ennerdale, Mayfair, Newclare, Bosmont, Crosby, Bertrams, Ophirton, Turfontein. We broadcast from Cape Town to Uganda +/- POTENTIAL 100,000 LISTENERS via SATELLITE. Radio Islam can now be heard throughout the world via our website, Streaming Audio - The website is updated daily and over 1 765 000 hits has been recorded from countries as far away as Australia, the USA, Saudi Arabia and the UK. This is testimony enough to our growing appeal. “Radio Islam is very educative, very professional.” Farouk Valiallah – Azaadville, South Africa. “I'm glued to Radio Islam. As a lady I have learnt so much about Islam.” Fatima Mangel – Lenasia, South Africa. “I am an ardent listener of Radio Islam (though I am not a Muslim myself) and was at first surprised by values and morals the Islam(ic) religion…as compared to the reality… people have about Islam.” Kweletsi Maphopha – South Africa. Good service delivery leads to happy customers and employee satisfaction for a job well done. As a rule, Radio Islam is dedicated to this policy of Batho Pele or People First. Through consultation we know how to meet the needs of our listeners. If we know what is important to our customers then we can set service standards that must be realistic depending on the resources we have. Access applies especially to the previously disadvantaged sectors of the community and to people with special needs. Our diverse staff makeup includes people from these sectors and our programming services these communities as well. Courtesy: is not only being polite to customers, but also being friendly, helpful and treating everyone with dignity and respect. Radio Islam excels in all these categories. Information: about our station is readily available. Just tune into MW 1548. Our station is also open and transparent. Honesty: is a fundamental rule in Islam. Redress: is making it easy for people to tell us they are unhappy with our service. Our staff is trained to deal with complaints in a friendly, helpful manner. Complaints can help us improve our station. At Radio Islam we always give the best value using all our resources. Assalamu Alaykum! Peace! Jazakallah! Thank You! Operation Brightsight – collection of spectacles given to TIBA. Collection of books and clothes given to deserving school children. • The Islamic Helpline – Radio Islam helped to establish this project. Operation Winter Woollies - collection and distribution of clothing in winter. The station has become a channel for publicising community events, programmes and needs, thereby earning not only the respect but also the assistance of the broader non-Muslim community. The advertising and marketing departments have embarked on a massive campaign to acquire maximum advertisers and sponsorship for the smooth running of the radio station. Alhamdulillah many businesses are advertising on a long term basis and are reaping the benefits of advertising which is very cost effective. Sponsorship have been acquired for a whole variety of programmes. The Advertising and marketing departments have become more professional in their approach with regards to their adverts. Customer care has become a vital part of our business. This can be clearly seen in the remarks made by our well wisher and customers in our registers and faxes sent to us. Advertising charges forms the bulk of the radio station's revenue. The business community supports the radio and this is borne out by the fact that monthly slots are booked out regularly. Small enterprises, including housewives are also encouraged to take up advertising slots. Radio Islam regularly attends meetings of the National Association of Broadcasters and the Independent forum of Religious Broadcasters of which we are members. We were also invited to an Open Society Conference hosted by the National Community Radio Forum. Besides this we are also signatories to the BCCSA and the Advertising Standard Authorities of South Africa. Alhamdulillah, Radio Islam has two auditors serving on the Board of Directors and an external auditor Karolia & Jeena Inc. Our finances are audited annually and displayed to the general public at every Annual General Meeting since inception.